Lama Zopa Rinpoche teaching at Tushita Meditation Centre, Dharamsala, India, June 2013. Photo by Ven. Sarah Thresher. 850 Nyung Näs – and More to Come! Thanks to all who have done and are continuing to do the practices recommended for Lama Zopa Rinpoche’s health and long life. Please continue to do these practices, and send FPMT Center Services your totals at the end of each month. Please join us in rejoicing in the practice totals so far. At the end of this year we will offer these totals to Lama Zopa Rinpoche at the official long life puja offered on behalf of the entire FPMT organization, which will be offered at Kopan Monastery, Nepal at the end of the one-month November course. Lama Zopa Rinpoche at Tushita Meditation Centre, Dharamsala, India, June 2013. “What a profound impact your book on How to Practice Dharma [published by Lama Yeshe Wisdom Archive] had on my mind. I had read about the eight worldly dharmas before numerous times – it never really impacted me like it did while reading your book. I wept and wept with the knowledge that after all these years of trying to learn the Dharma and thinking that I was making some progress practicing the Dharma, that in reality, I have never really practiced Dharma without the eight worldly dharmas controlling me – so much time has been wasted! Skies of thanks for your discovering Dharma, trying to practice Dharma with every action. Thank you very, very much. That’s the real Dharma. Even in the monasteries studying so much extensive philosophy, but sometimes Dharma gets left out for some people. Looking like practicing Dharma, but not practicing Dharma. It is so precious what you have discovered, what you experienced. You discovered Dharma, what Dharma is. Numberless thanks again. CHANGED: Khadro-la (Rangjung Neljorma Khadro Namsel Drönme) is now leading this retreat, not Lama Zopa Rinpoche, because Lama Zopa Rinpoche is finishing an important private retreat. We hope you are enjoying the redesigned FPMT website! We encourage you to check the FPMT News section often, as this is updated regularly and gives you a great snapshot of the FPMT organization’s wonderful and diverse activities. Subscribe to our different RSS feeds and never miss any news. For example, subscribe to get updates to Rinpoche’s Schedule or Important Announcements. Dharma Dates have moved! You will now find them under the Education/Practice tab. NEW! 1,000 Offerings to Namgyalma: The Supreme Gift of Immortal Life; The Way to Perform the Thousand Offerings in Relation to the Ritual of the Self and Front Generation of the Noble Ushnishavijaya. It is appropriate for those who have received a jenang of Ushnishavijaya/Namgyalma, based upon a great initiation into the action class of tantra. Available in eBook, booklet letter and A4 formats. Tsog of the Great Compassionate One Gyälwa Gyatso is a tsog offering practice written by Lama Yeshe. Available in eBook, booklet letter and A4 formats. A Short Daily Practice of Gyälwa Gyatso, written by Gung-thang Konchog Tanpai Dronme. Originally published in 1999, a newly updated 2013 edition is now available. Available in eBook, booklet letter and A4 formats. This year on Chokhor Duchen, July 12, which commemorates Lord Buddha’s first teaching, the Puja Fund sponsored an incredible array of pujas, recitations and other auspicious offerings and activities. Please rejoice in this amazing offering! Please note that this year, because His Holiness the Dalai Lama was teaching on July 12 and 13, Sera and Gyurme Monasteries did not perform the pujas and recitations usually requested. 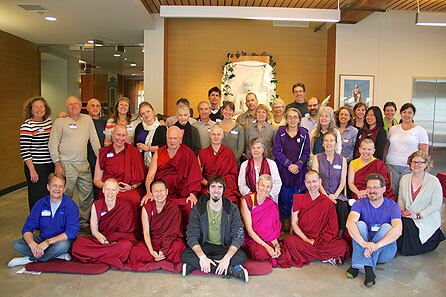 Mandala’s online content for July-September 2013 connects you with the vibrant and engaged international FPMT community! Read an interview with Ven. Sangye Khadro discussing the Masters Program. Listen to His Holiness the Dalai Lama talk about the potential of the mind. Gain perspective and ideas regarding environmental issues and Buddhism with contributions from Andrea Husnik, SPC at Panchen Losang Chogyen Gelugzentrum; Mark Waller, Maitripa College board member; and Canadian environmentalist David Suzuki. Get ideas on how to bless the waters in your region of the world. And much more! Give to the Mahayana tradition and grow on the Path together with a global Dharma community – become a Friend of FPMT. Friends nourish the organization and the work of FPMT International Office, joining for free or giving what they can with monthly donations and single gifts. Friends’ Dharma studies are supported with access to the FPMT Online Learning Center programs, downloadable Dharma gifts and other teachings. Friends connect to the international FPMT community with a Mandala magazine Friends subscription, and stay involved with special updates about what we accomplish together in the organization. 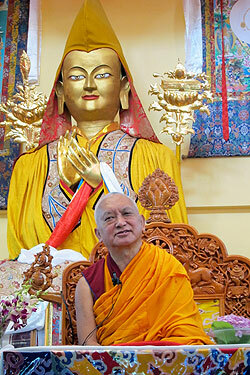 Learn more about how to become a Friend of FPMT. Our tremendous thanks to all current Friends of FPMT and those supporting the organization in myriad ways in centers, projects and services around the world. Purchase the Liberating Animals (book) and get Recitations for Animals (CD) for free. Purchase the Long Life Lama Chöpa with Request to the Dakinis (book) and get Lama Chöpa Tunes and Audio Guide (MP3 download) for free. “Centers, projects and services should not think we are here just to help people outside the center – we have to help people in the center as well. That is very important. We need to look after people living in the center who are sick, elderly, or who need help due to illness and so on. Dharma practice is not just learning the words but practicing, practicing bodhichitta and the six paramitas, understanding the shortcomings of samsara, which means renunciation. In the Bodhicharyavatara it says that even the mere thought to benefit sentient beings is much more beneficial than making offerings to all the buddhas and bodhisattvas. So no need to say how much more beneficial it is when you actually cause happiness for sentient beings. ‘Benefitting sentient beings’ means actually getting the opportunity to help someone in great need, so this is the best offering to numberless bodhisattvas and buddhas, and this is what most pleases the buddhas and bodhisattvas. Helping sentient beings as much as possible, just as a mother with her beloved child: if there is a choice, the mother would prefer to die rather than her child, she would rather die so that her child can live. 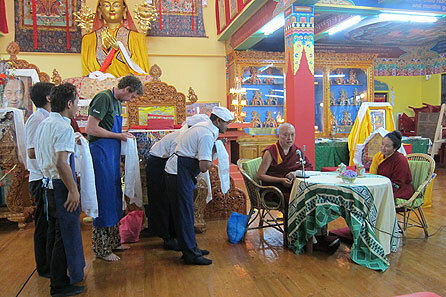 Lama Zopa Rinpoche (with Khadro-la) thanking the cooks and kitchen staff at Tushita Meditation Centre, Dharamsala, India, June 2013. Please let Claire know what your center, project or service did to celebrate Sangha! Thanks to all who made their annual donation to the Lama Yeshe Sangha Fund – it’s still not too late to do so for those who haven’t. Este es un video de Rimpoché dirigiéndose a los participantes durante la Reunión Nacional de Norteamérica en mayo 2013. En su presentación Rimpoché ofrece consejos y da las gracias de una manera especial. Es esencial e importante que todos lo veamos – vosotros los directores, coordinadores del programa espiritual y todos los que ofrecen servicio en vuestro centro, proyecto o servicio – para estar al día con la visión que Rimpoché tiene en cuanto a la dirección y prioridades de la organización en el futuro y para obtener logros. El video incluye la traducción de la transcripción. Podéis ver que Rimpoché esta lleno de energía. Que lo disfrutéis. Institut Vajra Yogini in France recently hosted a series of 108 nyung näs, with Lama Zopa Rinpoche sponsoring those doing the full 108. Three people completed 108 nyung näs each! Institut Vajra Yogini is hosting another round of 108 nyung näs: November 15, 2013 to June 19, 2014. 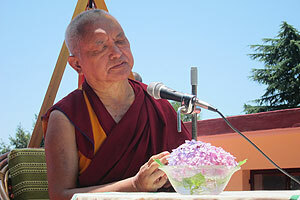 Once again Lama Zopa Rinpoche wishes to sponsor 10 students to do the 108 nyung näs. For more information please contact Institut Vajra Yogini. FPMT North America had a very fruitful meeting in May, and FPMT Europe just had a similarly fruitful meeting in July – with representatives from each of the 17 European countries which have an FPMT center, project, service or study group! 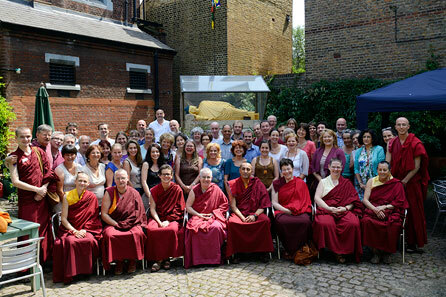 European Regional Meeting, Jamyang Buddhist Centre, London, UK, July 2013. FPMT International Office needs Mandarin and Spanish translators; Tushita Meditation Centre, India is looking for an FPMT registered teacher; International Mahayana Institute (IMI) needs a member services assistant; Vajrapani Institute, USA is looking for a retreat center manager.